Another nice day. it started off cloudy but dry and cleared to bright sunshine in the afternoon. After a short stretch on the A49, we continued south towards Leominster on B-roads. We stopped in Leominster to buy a picnic lunch before continuing. We turned off into country lanes and skirted around Hereford to the east. 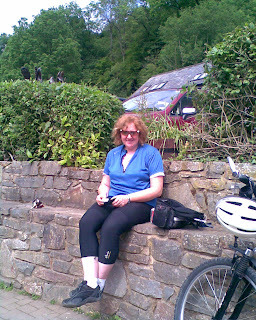 We ate our lunch at Fownhope - "Home of the Oak Tree", before continuing on increasingly hilly roads towards Ross-on-Wye. We turned off the B-road at How Capel and found a tiny lane which dropped down into the valley at Hole-in-the-Wall. 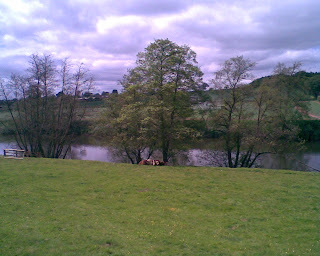 This stretch was really beautiful, running right alongside the river Wye. After a couple of miles, we had a steep climb out of the valley and then dropped in to a busy and congested Ross-on-Wye. We continued southwards past Goodrich Castle and turned off towards Symonds Yat, a picturesque beauty spot on the banks of the river Wye. Here we spent a relaxing hour, sitting by the river, drinking Coke and eating ice cream. The last climb of the day was a killer 1 in 5 climb up Symonds Yat Rock itself. This was possibly the hardest climb of the whole trip. I had trouble keeping my front wheel on the ground, due to the gradient. I managed to ride the whole climb despite having to stop half way up. Sue also rode most of the climb. Her knee, although still painful, seems better after the rest day. We stopped at the view point at the top with fine views across the hills and down to the river below. From here it was just a couple of miles to the Rock B&B at Hillersland. We had a mile long walk to the pub, the New Inn at Shortsighting. After dinner, washed down with a few pints of Wye Valley Ale, we took a leisurely walk back to the B&B. Total so far 779 miles.